This past week I visited Brush Salon to give my hair a little jeuge-jeuge. Usually when I'm shooting blog content or when I'm going out I add clip in hair extensions to give my hair a bit of extra volume and length. I had been thinking a lot lately around getting something a bit more permanent to save me that extra step in getting ready each day. I of course went to my forever go-to salon Brush to have this done because they are the absolute best and always know what's best for my hair. When I first had them put in my IG DM was flooded with questions from women wanting to know more so I wanted to put together a little FAQ and sort of debunk any hair extension myths for anyone interested in getting them done! Also, if you are planning on taking the leap into the fabulous world of long luscious locks, I would highly recommend going to Brush as I always do - they take hair very seriously and will only do what is best for you, plus they use the absolute best products to ensure you are well taken care of. 1. WHAT KIND OF EXTENSIONS DID YOU GET? These are tape-in extensions. There are quite a few different kinds of extensions but tape-ins are supposed to be the best option and allow for no damage to the natural hair. I had always heard of tape-in extensions, but I never realized that they were straight up TAPED IN. It was bizarre to find that out! They legit peel the hair off a sticker and tape it into your head! Having the hair on a strip allows the stress of brushing/pulling to be on a long strip of hair vs. say when you get clamped in hair extensions where it's clamped to such a small section you can risk pulling it right out. These will last anywhere from 6-8 weeks depending on how fast your hair grows. The hair itself will last up to a year with proper care, you would just need to have them re-taped about every 6-8 weeks. No. 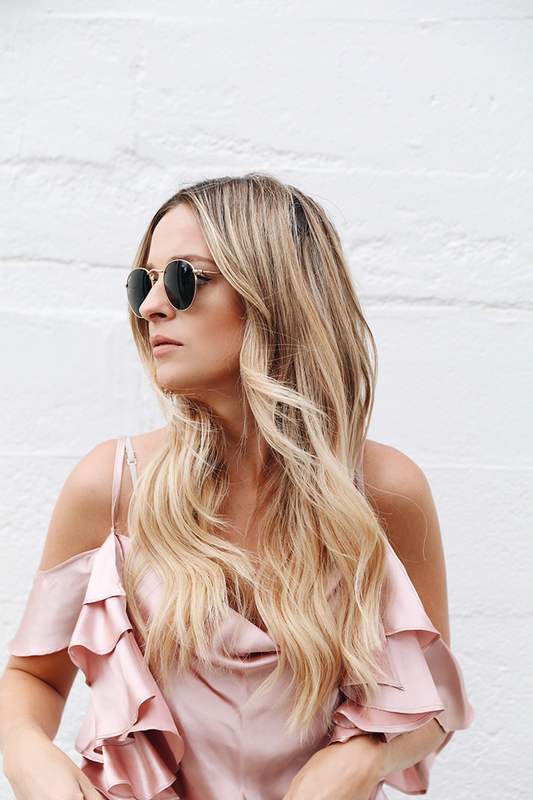 This is one of the BIGGEST myths of hair extensions - even for myself. I always thought I needed to stay far far away because my natural hair is a bit damaged as it is and I never wanted to risk any further damage from getting hair extensions. Now, don't get me wrong, when I was younger, my older sister got sort of a glue/clamp hybrid type hair extension done, and yes, those were damaging as they are straight up glued onto little sections of your hair!!! I remember her pulling little chunks out as they came loose/broke off - YIKES!! However, again, these are tape-ins - they are the best on the market and with proper care will not damage your natural locks. There's obviously and definitely some extra weight back there that takes some getting used to. That being said they never actually feel 'heavy' or that they're pulling or weighing me down. 5. CAN YOU STILL WEAR YOUR HAIR UP? Yes! The tape is invisible and flexible - they've also hidden them so well I have no problems doing the most adorable high ponies! That's actually been my go-to hair style since getting them done - so cute with all those locks! The set I got was 16" long which was definitely long enough for me! The 16" were $875, you can also get 12" or I believe 18" but I'm not too sure on the pricing of those. I think I could have almost done with the 12" to make it a bit more budget friendly. Also, after the 8 weeks when it's time to have them re-taped this costs around $200. Honestly, it seems like a big number at first, but if you think about it, it's just the initial cost of the hair and that will last you a year or maybe more and then the re-tape fee is even less than a usual salon visit. It's definitely a treat-yo-self type situation but I definitely think it is worth it. Put a little away every week so you can go all out - you won't regret it.